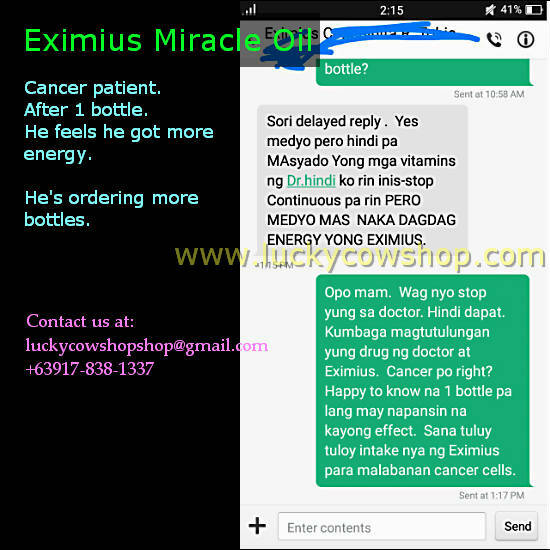 My buyer bought 1 bottle of Eximius Miracle Oil for his husband who has a cancer. They are so eager to try Eximius because they know someone who has a friend confined in a hospital because of cancer. That person was saved by Eximius Miracle Oil. 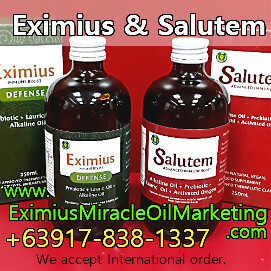 As a starter, they bought 1 bottle of Eximius Miracle Oil and put it to a test. Wife of cancer patient: "Sorry for the delayed reply. Yes a little (I as asking if her husband health condition has improved after taking that 1 bottle). He didn't stop taking the vitamins the doctor gave him. He got more energy because of Eximius." Marilou (me): "Yes mam. Do not stop taking the doctor's. He shouldn't. It's like the medicine the doctor gave him and the Eximius would help each other. Cancer right? Happy to know that just 1 bottle you have noticed good effect. Hope he'll continue to take Eximius to fight the cancer cells." They actually ordered more bottles.